I love when Olive Garden has their unlimited soup, salad, and breadsticks! It was always a treat to go in and indulge in their perfectly cooked breadsticks, a salad that has the best dressing ever, and of course the Zuppa Toscana soup! Zuppa Toscana Olive Garden Copycat Instant Pot Soup truly is savory and succulent. We eat soup all year round, more often in the winter months, and this is a soup I always keep in our rotation. 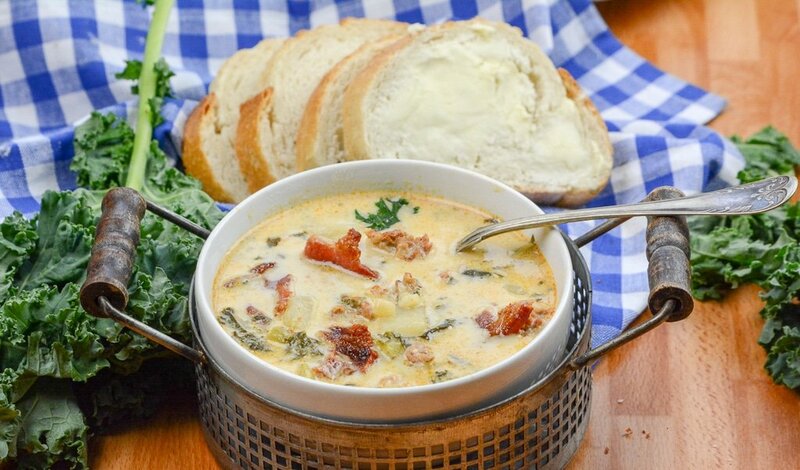 Copycat Olive Garden Zuppa Toscana soup tastes just like the restaurant version, but you can make it in your instant pot. Plus it is incredibly easy and minimal effort needed for a fool-proof winning dish to serve to your family. I rarely go to Olive Garden because I have used a lot of copycat recipes that give me the great flavors I am craving. It saves me time and money from having to leave the house, and each dish comes out just like the restaurant. Why buy it when you can make it at home with easy to find ingredients? To me, it is a no-brainer. 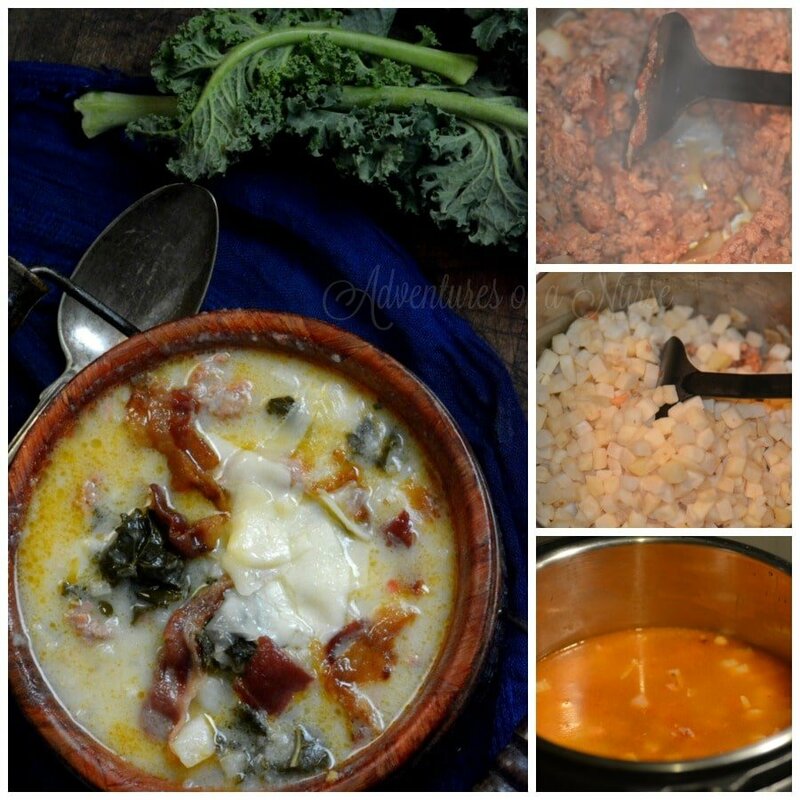 Zuppa Toscano soup is so different in flavors from other soups I have had over the years. 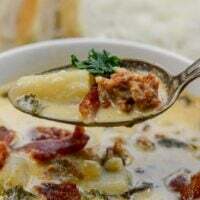 It is a rich and creamy base with chunks of Italian sausage, bacon, chopped kale, and a variety of herbs and spices. Each bite is like a flavor explosion in your mouth of goodness. I am not sure any other soup has such a wide variety of flavors and textures like this one. I highly recommend trying out this Instant Pot version if you love the Olive Garden soup. As you all know I have a strong love with my Instant Pot. You might like the whole month of Instant Pot meals on a Budget that you can cook each day of the week, all using your Instant Pot. 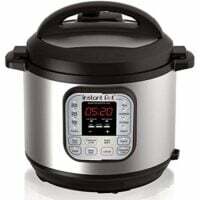 I am determined to create all my favorite recipes into an adapted recipe using my Instant Pot. I am Insta-potting my way through the recipes, to bring you guys all my classics, favorites, copycats, and more. Let me assure you each recipe I put out will be a hit in your home if you like the ingredients! Just like this soup, it is something totally different and offers a unique flavor and texture with each bite, that really will be a pleasure to devour. This is one filling soup and reheats beautifully. Give it a try for a quick and easy weeknight meal, all things to our beloved Instant Pot! 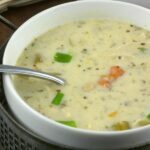 More Instant Pot Soups that are a Must Try! 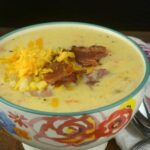 The Ultimate Instant Pot Loaded Corn Chowder, Panera’s Broccoli and Cheddar Soup, And Panera’s Chicken and Wild Rice Soup. 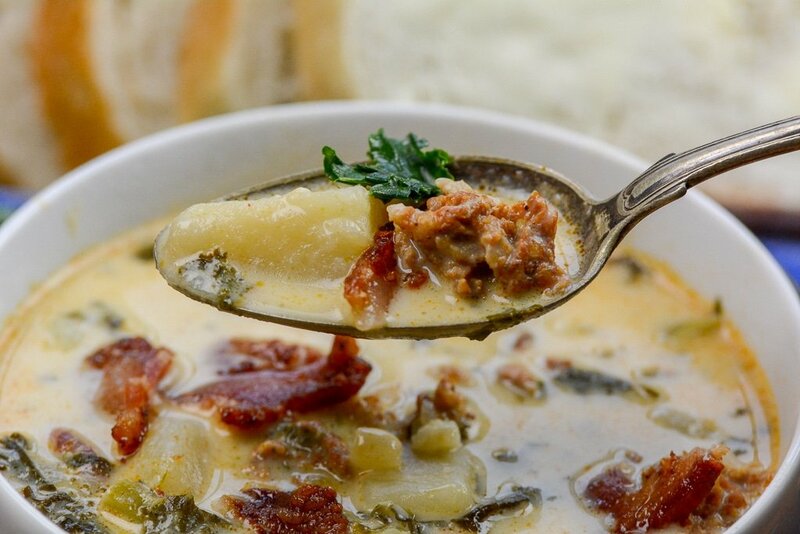 Zuppa Toscana Olive Garden Copycat Instant Pot Soup truly is savory and succulent. We eat soup all year round, more often in the winter months, and this is a soup I always keep in our rotation. Copycat Olive Garden Zuppa Toscana soup tastes just like the restaurant version, but you can make it in your instant pot. Place you Pot on saute add olive oil and onions, garlic, and sausage. Brown sausage until it crumbles. Add potatoes, chicken broth, and place Kale on top. Cover and place pot on manual high pressure for 10 minutes. Place pot back on saute. Stir in milk or cream. Chop your bacon and stir in your soup. Enjoy with a hearty Italian bread. This was super yummy! I’m avoiding dairy so I skipped the milk and just added a little more broth and potatoes, then partially blended it at the end for a creamy texture. The whole family loved it – even the kale haters! This was the first thing I cooked in my instant pot! I saw so many great reviews on Facebook IPot pages that I had to try it myself. It was a hit with the whole family! Thank you so much for sharing this. How many servings did you get? I didn’t see anything that told me the amount of servings? I wait and stir in the kale just before the milk and cream. It just needs to wilt, not cook. Me too! Just add kale at the very end to wilt it. If you are using fresh potatoes, not frozen, how long would you cook it for? I would think that 15 minutes would be too long for diced fresh potatoes. We made this last night and LOVED it! So easy to prepare and so delicious! Thanks for the recipe, we will definitely be making it again. I made this today, and am now enjoying my first bowl — scrumptious! I have rheumatoid arthritis and cannot stand for very long; so, I used Italian sausage links, cut into 3/4-inch chunks, which seems to require somewhat less tending to. I will try frozen cubed potatoes next time, but the fresh potatoes came out just fine for the suggested 15-minute cook time. I made this today and marveled at how it turned out. It was so good it would make a jackrabbit kiss a hound dog! Thank you so much for the recipe. Top comment of the day you cracked me up! Made it today, delicious! Thank you for the recipe. I think we all add our little tweaks to the recipe, which makes it more fun! Mine was delicious! This was fantastic! I doubled the recipe in my 6qt Duo and it still worked great! I think 10 minutes is long enough if your broth is already hot. That way your potatoes hold up better. I added New Mexico green chiles and used hot Italian sausage. Talk about amazing! So delicious! My husband was recently diagnosed with diabetes so I cut out the potatoes, but still amazing!! Thanks! Could I substitute the sausage for hamburgers. I don’t like Italian sausage. I just use regular sausage not Italian, as it’s too spicy for my young kids. Hamburger is less flavorful than sausage so you may have to add spices if you use it. Made this tonight for dinner. It was so good. It will be one of my go to recipes. Thank you for this recipe. This was very good! A few things we did: 1) use sweet Italian sausage instead of hot because we wanted our daughter to be able to eat it, 2) used fresh diced potatoes (they were very soft, but still mostly held their shape after 15 minutes), 3) used Canadian bacon because I realized last minute I didn’t have any “normal” bacon, 4) added kale to wilt right before milk, 5) used 1% milk. It came together very quickly, and was SO flavorful! Although I have never had The Olive Gardens Zuppa, this was easy to make and very good. I will have to try some of your other copy cats. The Zuppa soup was really yummy! My only issue was the milk/cream seemed to separate once I added it to the pot (after cooking). It still tasted great but wasn’t so visually appealing 🙂 Any tips or suggestions? Did you copy Olive Garden or Pressure Luck? Slightly different from the recipe on Pressure Luck, but causes me to wonder about the origin of what you posted and how you can claim authorship (especially when you read the comments on PL’s post). Well since I made this recipe 2 years ago and Jeffery 2 weeks ago…..
Well seeing as my recipe came before pressure luck Jeffery is a friend of mine I actually encouraged him to start a blog for his recipes!!! Looking forward to trying this. My question is after I do the quick release, the directions say to place pot back on sauté and then stir in cram and add bacon. So do I turn the sautés mode back on? If so, for how long? Just enough when adding the other ingredients or for a set time? Omg this turned out amazing and so easy to make! I ran out of cream so I used sour cream. Came out great. Wow! It really does taste just like what you get at Olive Garden. I usually don’t write reviews because I tweek recipes too much and it is not a true review on the recipe. This time, I did tweek some but believe I stayed with the heart of the recipe. I used Turkey Hot Italian Sausage, to be a little healthier. When I put the two cups of the frozen hash browns, I was afraid it would not be enough, so I added another cup. I used Half and Half also. My husband and I both enjoyed it so much. I am eating leftovers as I write this. A definite keeper. Thanks! Can I use spinach instead of kale? Just curious…….why does this have bacon in it? 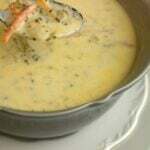 I’ve been eating the Zuppa Toscana soup for years at Olive Garden and I’ve never tasted or found any bacon in it! Maybe it’s a regional thing, but the soup I’ve eaten there definitely had no bacon. Do you add the bacon on top of each bowl of soup or do you just add it to the whole pot of soup?